Pink, Olive 1930 , Olive Pink Collection. 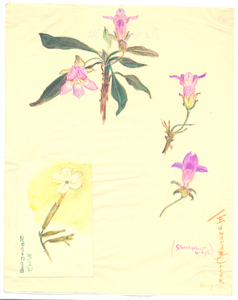 Coloured pencil on paper sketched by Olive Pink at Edwards Creek, South Australia, 25/7/30 ( shrub about 4ft high) Identified by Olive Pink as Eremophila - medicinal. Attached - paper, small watercolour painted at Rodinga, Northern Territory, 18/9/30 , University of Tasmania Library, Special & Rare Materials Collections, Hobart. Copyright: Estate of Olive Pink and the University of Tasmania.This material is subject to copyright protection. Further dealings with this material may be a copyright infringement.